Long, long ago in Milan there was a very hard winter and snow covered the whole city. Under the eaves of a building there was a nest of a family of blackbirds (le merle), which at that time had feathers white as snow. Besides the parents, there were three baby birds. The little family suffered from the cold and struggled to find anything to eat, and even the few crumbs they found were immediately covered with snow. After a time, the father decided they should move the nest closer to the chimney, so he could look for food farther away from the nest, where there was no snow. The mother and the little birds stayed in the nest all day to stay warm, but soon were covered with the smoke from the chimney. After three days, the father returned to the nest, and was almost unable to recognize his family, as the black smoke from the chimney had changed all their feathers from white to black! Fortunately, from that day on, the winter became less rigid and the blackbirds were able to find enough food to get to the spring. 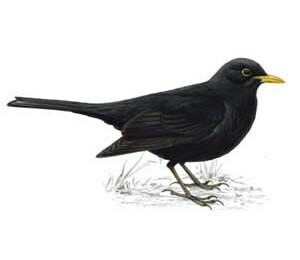 From that day, however, all blackbirds are born with black feathers and the last three days of January are known as the three days of the blackbird. There is an Italian legend that says the last three days of January (29, 30, 31) are the coldest days of winter, thanks to the actions of a female bird. The story goes that a bird with white feathers had a feud with January, since the weather was so cold, and it was hard for the bird to find food in the snow. However, the wily bird stockpiled food in December, and then didn’t have to venture forth during January. As it happens, in those days, January only had 28 days. The bird thought she had outwitted January by storing food away, and bragged about it. January was not amused by this, and asked to borrow 3 days from February. Then, to spite the bird, January made these extra 3 days in his month the coldest, most brutal days of the month. The poor bird took refuge in a chimney for 3 days, and when she emerged on February 1st, her beautiful white feathers had become black, which they remain to this day. And though the weather is more temperate in Italy this year, Italians are feeling the bite of winter more profoundly, due to taxes being raised and the high cost of fuel. Prime Minister Monti has the unenviable job of finding ways to deal with the astronomical debt incurred during his predecessor, Berlusconi's, long reign. However, many of the necessary changes are unpopular with Italians. Not only has the cost of heating increased, but transportation of goods has been stalled in some areas. Today one of my friends said there was no food in the stores of his village in Southern Italy: due to strikes protesting the rising cost of gasoline, goods cannot be delivered. Taxi drivers had a strike earlier this week, and today truck drivers have created blockades on many highways throughout Italy. A ten-day gas strike is looming. Let's hope that there will be some good news, or perhaps even a hint of transformation next week, arriving as it did for la merla, at the beginning of February. Instead of a reprieve from winter weather, things have become worse this week. Infatti, Italy is experiencing the coldest winter weather in 27 years! The truckers who were on strike last week are now unable to drive due to the snow-packed, icy highways. Bologna has nearly 20 inches of snow and it's still snowing! Trains are delayed by as much as 7 hours, and others simply will not run. So it seems i giorni della merla will continue throughout this first week in February. I am impressed with all your Skype interactions, you must be up to date with the weather we are getting here then! Interesting you should write about the blackbird legend just as the temperate weather turns into the coldest winter since 1985! It is snowing here so I am enjoying staying warm and catching up with all my blogging friends. Benvenuta! Yes, my Italian friends have become another kind of family, and help me to continue my "Italian" life while I'm in the States. I feel cherished by them, and they are equally precious to me. In fact, I often see and share more with my Italian friends each week than with friends and family here at home! It's compelling and enriching, and we help each other learn while sharing our lives.